I gave notice at my day job today. Fourteen years I've been there. Wrapping it up in the next two weeks to go be a writer full-time. I know. All of a sudden, isn't it? Well, it's been a long process of working in the wee hours of the day and night, but I've finally reached a point where I can't do everything all the time. I have reached the point of needing to simply. Of course, it get complicated when Neal Stephenson twitters& today that "Our first demo of the new novel I am writing with Greg Bear, Nicole Galland, Mark Teppo, and others" will be happening next week in San Francisco. For those of you who don't know, The Mongoliad is a sort of serialized story, created by Neal Stephenson, and written by Neal, Greg Bear, Nicole Galland, and a number of other great authors. It will be told via custom apps on iPad, iPhone, Kindle, and Android, and will be something of an experiment in post-book publishing and storytelling. The Mongoliad is a rip-roaring adventure tale set 1241, a pivotal year in history, when Europe thought that the Golden Horde was about to completely destroy their world. The Mongoliad is also the beginning of an experiment in storytelling, technology, and community-driven creativity. Our story begins with a serial novel of sorts, which we will release over the course of about a year. 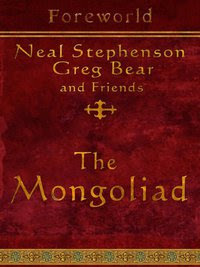 Neal Stephenson created the world in which The Mongoliad is set, and presides benevolently over it. Our first set of stories is being written by Neal, Greg Bear, Nicole Galland, and a number of other authors; we're also working closely with artists, fight choreographers & other martial artists, programmers, film-makers, game designers, and a bunch of other folks to produce an ongoing stream of nontextual, para-narrative, and extra-narrative stuff which we think brings the story to life in ways that are pleasingly unique, and which can't be done in any single medium. If you'll be in San Francisco on the 25th of May you can catch of preview of what we are in store for at the SF App Show. Since it will be released on Droid I'll definitely be taking a gander. Can you feel the meta? I know I do. Hats off to Mark Teppo who is moving on to being a full-time writer. It must be daunting to make that move, but he is involved in a project at the ground floor that could help usher in a new way of publishing and interactive with stories. We're also working closely with artists, fight choreographers & other martial artists, programmers, film-makers, game designers, and a bunch of other folks to produce an ongoing stream of nontextual, para-narrative, and extra-narrative stuff which we think brings the story to life in ways that are pleasingly unique, and which can't be done in any single medium.